After several days of cold maceration we inoculated the must with a fruit enhancing yeast strain. Immediately following fermentation and pressing, the wine was subsequently filled into barrels, so a malo-lactic conversion would transpire in small cooperage. Following the completion of ML in January, it was aged for another five months in barrels - a combination of 10% new Hungarian oak, 8% once used Hungarian and French oak, along with the balance in relatively neutral French oak. Fruity, soft and supple; it possesses aromas and flavors of black cherry and boysenberry, along with subtle hints of anise and vanilla; nuanced and offering an elegant, dry finish. "I was in Northern California last week judging at the Sonoma County Harvest Fair wine competition, and I spent some of my time tracking down interesting producers whose wines I’d never tried. 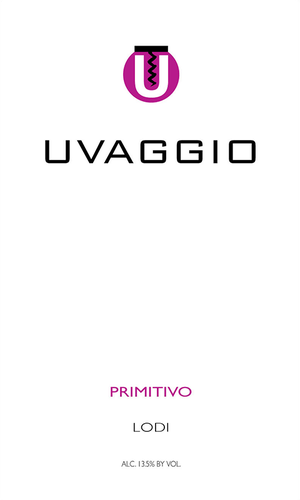 This racy, floral-scented 2011 Uvaggio Primitivo, a deliciously balanced red from the Lodi region with a taste of spice and juicy berries and layers of flavors, is one of my discoveries. I think it’s the ultimate gourmet pizza wine — soft and easy to drink, yet surprisingly complex for its well-under-$20 price. Uvaggio’s opinionated winemaker, Jim Moore, is no wine newcomer. Years ago, he was a force behind the now-defunct La Famiglia di Robert Mondavi label that specialized in Italian varietals such as Sangiovese, as well as helping launch Luce, the Mondavi collaboration project with Tuscany’s Frescobaldi family. Moore made California’s first Vin Santo..."